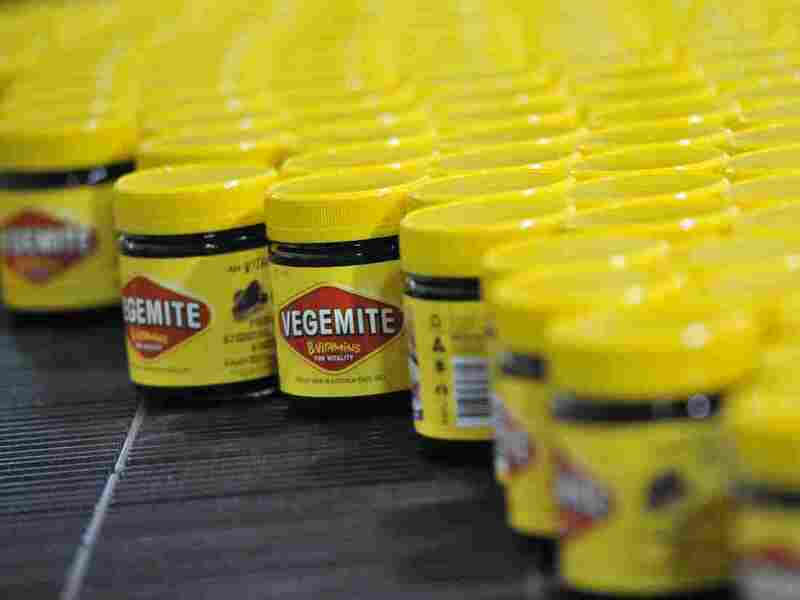 Australian Government Concerned Over Vegemite's Use In Moonshine : The Two-Way In 19 officially dry aboriginal communities in the Northern Territory, the dark-brown yeast-based spread is reportedly being purchased in bulk to produce homebrew. Vegemite rolls along the production line at the Vegemite factory in Melbourne, Australia, in 2013. The iconic yeast-based spread is reportedly being used to produce moonshine in officially dry communities. The Australian government is warning that Vegemite — the salty yeast-based spread that's an iconic staple of the national diet — is being purchased in bulk quantities to produce moonshine in rural indigenous communities where alcohol is banned. Brewer's yeast is a key ingredient of the dark brown paste, which was first developed as a substitute for Marmite when the supply of the British-made spread in Australia was virtually cut off during World War I. The Sydney Morning Herald reports that the misuse of Vegemite "has been described as prolific in some areas in the Northern Territory, with reported instances of people buying up to twenty jars of Australia's favourite spread at a time, for the brewing of homemade alcohol." Chronic alcoholism is a serious problem among Australia's aboriginal community and laws in a number of indigenous areas restrict the sale and consumption of spirits. In some of them, Vegemite, sometimes fermented in bathtubs, is being used to skirt the laws, officials say. The Australian writes that "adults and even young children are getting drunk on the home brew, which at times is mixed with orange juice." Indigenous Affairs Minister Nigel Scullion emphasized that the government "is not seeking to place any restrictions on Vegemite or any other yeast product that may be used in home brew in remote communities. "Our priority has always been to get kids to school, make communities safer and get people into jobs. Businesses in these communities also have a responsibility to report any purchase that may raise their own suspicions," Scullion said. Prime Minister Tony Abbott echoed that sentiment: "The last thing I want to do is have a Vegemite watch," he told reporters in Brisbane on Sunday, according to The Australian. "Vegemite, quite properly, is for most people a reasonably nutritious spread on your morning toast or on your sandwiches." Dr. John Boffa of the Alice Springs-based People's Alcohol Action Coalition, tells the BBC that the problem is not widespread. "We're talking about an isolated problem in a couple of communities around a very large nation, and a nation where there is a very large number of Aboriginal communities, and every community is different," Boffa said.